Image: Pt. 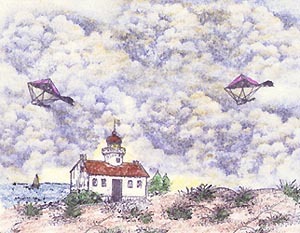 Loma Light House by company unknown. Cloud (Cumulus) 018E, and Hanglider 044A by Stampscapes®. Note: Old Pt. Loma lighthouse. San Diego, CA. Built 1855 Cape Cod style. Served for 36 years, then replaced by a skeletal tower near sea level. Reason: Didn't pick up low lying fog and useless to passing ships. J.N.